We already thought there's one too many smarphone platforms on the market but here come Samsung announcing the Bada OS. It should make its way to a huge range of devices over the next few years replacing the Symbian OS and WinMo in the company's portfolio. The new OS, named "Bada" (meaning "Ocean" in Korean) is supposed to deliver rich smartphone experience to a wider range of consumers across the world. We guess that should be interpreted as a sign that it won't be reserved for high-end devices only. There are hardly much known details about the UI itself right now, but those should become available by the time the new SDK is released in December. The Bada OS should stand alongside Android in the company's portfolio. 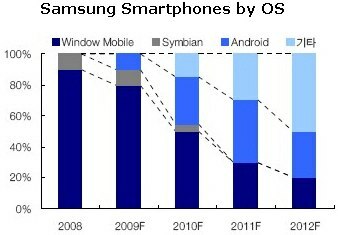 The share of Windows Mobile smartphones will be brought down to 50% next year and even further to only 20% by 2012. By that time the company should also have completely axed Symbian OS althogether. Android-based smartphones will be around 30%, or over 10 kinds of models, according to the report by a Seoul-based brokerage firm. We're not really sure what will happen with the LiMo Foundation that Samsung are actively taking part in along with several other manufacturers. Samsung and Vodafone already have two LiMo devices. Both Vodafone 360 Samsung M1 and Vodafone 360 Samsung H1 are already available through the Vodafone networks.